Mummy Of 3 Diaries: #Win a Sweet Selection Box packed Full of British sweets! 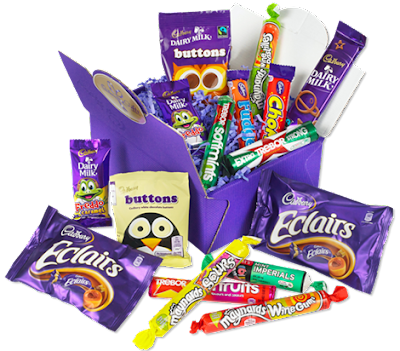 #Win a Sweet Selection Box packed Full of British sweets! packed Full of British sweets! It may always rain and the weather may be unpredictable but there are some good things about Britain, like it's creamy chocolate and sugary sweets. Britain is home to so many top brands that we all know and love like Cadburys, Maynards and Trebor. It's been raining a lot here over the past few weeks so I've decided to run this little giveaway to cheer you up. I mean what's more cheery than a box of chocolates and sweets - right! This giveaway is not sponsored in any way - I am paying for this prize. This awesome box of treats includes: 2 Cadbury Chocolate Eclairs, 1 Dairy Milk Bar, 1 Cadbury Freddo Bar, 1 Cadbury Freddo Caramel Bar, 1 White Chocolate Buttons, 1 Cadbury Chocolate Buttons, 1 Cadbury Fudge, 1 Cadbury Chomp, 1 Maynards wine gums Roll, 1 Maynards Sours Roll, 1 Maynards Wine Pastilles Roll, 1 Bassett's Mint Imperials 1 Trebor Extra Strong Mints, 1 Trebor Peppermint Softmints and 1 Trebor Soft Fruits. If you would like the chance to win it all - Simply enter using the RaffleCopter Form below. It may take a few seconds to load but please be patient, it will load. Terms & Conditions - This giveaway is open to the UK only due to delivery costs. One winner will be picked at random on Sunday August 13th using the RaffleCopter App. I love fish and chips - eaten out of the paper down by the sea! Now that is a real treat! Cadburys chocolate - particularly Wispa. Cadbury chocolate, there is no better choccy! Fish and chips preferably by the seaside. Afternoon tea with scones, cornish cream and jam - all served on best china made in England. Definitely fish and chips - never as good outside this country! Oh there are loads! I love Cornish Pasties, Cheddar cheese, Cream teas, Fish and chips, Sunday roasts and Cadbury's chocolate! A normal dairy milk. Classic - can't beat it! I absolutely adore haggis ....a Scottish treat! Definitely a curry... not so traditionally British in a cultural sense but it has become traditional, socially! Every Brit loves a good curry at the local curry house or pub. The Flake is my downfall, love them. cadburys caramel bar, i used to love the caramel barrels too! Gotta be fish and chips! Ooh what a brilliant selection, heaven :) very generous, thank you. Really hard to choose my favourite British treat - I adore British chocolate but I think I would have to go for fish and chips - but PROPER fish and chips like you can't really seem to get these days. They have to be in paper, don't want any of this paper bag or polystyrene tray rubbish. Love " Fish & Chips "
A good old cup of tea!